Libeskind in front of his extension to the Denver Art Museum. Daniel Libeskind (born May 12, 1946) is a Polish-American architect, artist, professor and set designer. Libeskind founded Studio Daniel Libeskind in 1989 with his wife, Nina, and is its principal design architect. His buildings include the Jewish Museum in Berlin, Germany, the extension to the Denver Art Museum in the United States, the Grand Canal Theatre in Dublin, the Imperial War Museum North in Greater Manchester, England, the Michael Lee-Chin Crystal at the Royal Ontario Museum in Toronto, Ontario, Canada, the Felix Nussbaum Haus in Osnabrück, Germany, the Danish Jewish Museum in Copenhagen, Denmark, and the Wohl Centre at the Bar-Ilan University in Ramat-Gan, Israel. His portfolio also includes several residential projects. 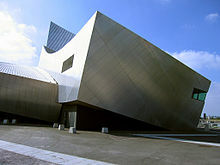 Libeskind's work has been exhibited in major museums and galleries around the world, including the Museum of Modern Art, the Bauhaus Archives, the Art Institute of Chicago, and the Centre Pompidou. On February 27, 2003, Libeskind won the competition to be the master plan architect for the reconstruction of the World Trade Center site in Lower Manhattan. Libeskind's addition to the Royal Ontario Museum in Toronto (2007). Born in Łódź, Poland, Libeskind was the second child of Dora and Nachman Libeskind, both Polish Jews and Holocaust survivors. As a young child, Libeskind learned to play the accordion and quickly became a virtuoso, performing on Polish television in 1953. He won a prestigious America Israel Cultural Foundation scholarship in 1959 and played alongside a young Itzhak Perlman. Libeskind lived in Poland for 11 years and can still speak, read, and write the Polish language. In 1957, the Libeskinds moved to Kibbutz Gvat, Israel and then to Tel Aviv before moving to New York in 1959. In his autobiography, Breaking Ground: An Immigrant's Journey from Poland to Ground Zero, Libeskind spoke of how the kibbutz experience influenced his concern for green architecture. In the summer of 1959, the Libeskinds moved to New York City on one of the last immigrant boats to the United States. In New York, Libeskind lived in the Amalgamated Housing Cooperative in the northwest Bronx, a union-sponsored, middle-income cooperative development. He attended the Bronx High School of Science. The print shop where his father worked was on Stone Street in Lower Manhattan, and Libeskind watched the original World Trade Center being built in the 1960s. Libeskind became a United States citizen in 1965. Libeskind met Nina Lewis, his future wife and business partner, at the Bundist-run Camp Hemshekh in upstate New York in 1966. They married a few years later and, instead of a traditional honeymoon, traveled across the United States visiting Frank Lloyd Wright buildings on a Cooper Union fellowship. Nina now serves as COO for Studio Daniel Libeskind. In 1968, Libeskind briefly worked as an apprentice to architect Richard Meier. In 1970, he received his professional architectural degree from the Cooper Union for the Advancement of Science and Art; he received a postgraduate degree in History and Theory of Architecture at the School of Comparative Studies at the University of Essex in 1972. The same year, he was hired to work at Peter Eisenman's New York Institute for Architecture and Urban Studies, but he quit almost immediately. He is both a U.S. and Israeli citizen. Nina and Daniel Libeskind have three children: Lev, Noam, and Rachel. Libeskind began his career as an architectural theorist and professor, holding positions at various institutions around the world. From 1978 to 1985, Libeskind was the Director of the Architecture Department at Cranbrook Academy of Art in Bloomfield Hills, Michigan. His practical architectural career began in Milan in the late 1980s, where he submitted to architectural competitions and also founded and directed Architecture Intermundium, Institute for Architecture & Urbanism. 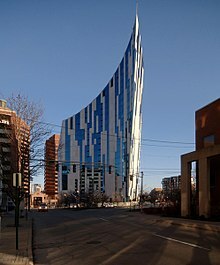 Libeskind has lived, among other places, in New York City, Toronto, Michigan, Italy, Germany, and Los Angeles, and has taught at numerous universities across the world, including the University of Kentucky, Yale University, and the University of Pennsylvania. Since 2007, Libeskind has been a visiting professor at the Leuphana University Lüneburg in Lüneburg, Germany. Libeskind completed his first building at the age of 52, with the opening of the Felix Nussbaum Haus in Osnabruck, Germany in 1998. Prior to this, critics had dismissed his designs as "unbuildable or unduly assertive." In 1987, Libeskind won his first design competition for housing in West Berlin, but the Berlin Wall fell shortly thereafter and the project was cancelled. 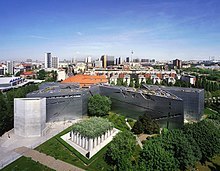 Libeskind won the first four project competitions he entered including the Jewish Museum Berlin in 1989, which became the first museum dedicated to the Holocaust in WWII and opened to the public in 2001 with international acclaim. This was his first major international success and was one of the first building modifications designed after reunification. A glass courtyard was designed by Libeskind and added in 2007. The Academy of the Jewish Museum Berlin also designed by Libeskind was completed in 2012. Libeskind is perhaps most famous for being selected by the Lower Manhattan Development Corporation to oversee the rebuilding of the World Trade Center, which was destroyed in the September 11, 2001 attacks. He titled his concept for the site Memory Foundations. Studio Daniel Libeskind, headquartered two blocks south of the World Trade Center site in New York, is currently working on more than forty projects across the world. He has designed numerous cultural and commercial institutions, museums, concert halls, convention centers, universities, residences, hotels, and shopping centers. The studio's most recent completed projects include Haeundae Udong Hyunai I'Park in Busan, South Korea, Academy of the Jewish Museum Berlin in Berlin, Germany, modifications and additions to the Bundeswehr Military History Museum in Dresden, Germany and Reflections at Keppel Bay in Singapore. In addition to his architectural projects, Libeskind has worked with a number of international design firms to develop objects, furniture, and industrial fixtures for interiors of buildings. He has been commissioned to work with design companies such as Fiam, Artemide, Jacuzzi, TreP-Tre-Piu, Oliviari, Sawaya & Moroni, Poltrona Frau, Swarovski, and others. 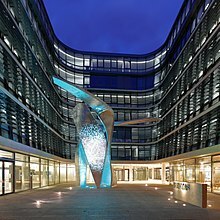 Libeskind's design projects also include sculpture. Several sculptures built in the early 1990s were based on the explorations of his Micromegas and Chamberworks drawings series that he did in the late 1970s and early 1980s. The Polderland Garden of Love and Fire in Almere, Netherlands is a permanent installation completed in 1997 and restored on October 4, 2017. Later in his career, Libeskind designed the Life Electric sculpture that was completed in 2015 on Lake Como, Italy. This sculpture is dedicated to the physicist Alessandro Volta. Libeskind has designed opera sets for productions such as the Norwegian National Theatre's The Architect in 1998 and Saarländisches Staatstheater's Tristan und Isolde in 2001. He also designed the sets and costumes for Intolleranza by Luigi Nono and for a production of Messiaen's Saint Francis of Assisi by Deutsche Oper Berlin. He has also written free verse prose, included in his book Fishing from the Pavement. While much of Libeskind's work has been well-received, it has also been the subject of often severe criticism. Critics often describe Libeskind's work as deconstructivist. Critics charge that it reflects a limited architectural vocabulary of jagged edges, sharp angles and tortured geometries, that can fall into cliche, and that it ignores location and context. In 2008 LA Times critic Christopher Hawthorne wrote: "Anyone looking for signs that Daniel Libeskind's work might deepen profoundly over time, or shift in some surprising direction, has mostly been doing so in vain." In 2006, in the New York Times Nicolai Ouroussoff stated: "his worst buildings, like a 2002 war museum in England suggesting the shards of a fractured globe, can seem like a caricature of his own aesthetic." In the UK magazine Building Design, Owen Hatherley wrote of Libeskind's students' union for London Metropolitan University: "All of its vaulting, aggressive gestures were designed to 'put London Met on the map', and to give an image of fearless modernity with, however, little of consequence." William JR Curtis in Architectural Review called his Run Run Shaw Creative Media Centre "a pile-up of Libeskindian clichés without sense, form or meaning" and wrote that his Hyundai Development Corporation Headquarters delivered "a trite and noisy corporate message". In response, Libeskind says he ignores critics: "How can I read them? I have more important things to read." The following projects are listed on the Studio Libeskind website. The first date is the competition, commission, or first presentation date. The second is the completion date or the estimated date of completion. In 2003, he received the Leo Baeck Medal for his humanitarian work promoting tolerance and social justice. Received an Honorary Doctorate of Architecture from the University of South Florida. ^ Libeskind, Daniel (2004). Breaking Ground. New York: Riverhead Books. p. 88. ISBN 1-57322-292-5. ^ Studio Daniel Libeskind, 1. "Projects". Archived from the original on May 11, 2008. Retrieved June 12, 2008. ^ Studio Daniel Libeskind. "Exhibitions". Archived from the original on May 11, 2008. Retrieved July 29, 2008. ^ Royal Ontario Museum. "Hiroshi Sugimoto-Daniel Libeskind: The Conversation". Retrieved June 12, 2008. ^ Marek, Michael (February 18, 2010). "Architect Libeskind took unusual path to an international career". dw.de. ^ Libeskind, Daniel (2004). Breaking Ground. New York: Riverhead Books. pp. 11, 10, 35. ISBN 1-57322-292-5. ^ a b Studio Daniel Libeskind. "Studio Daniel Libeskind: Daniel Libeskind". Retrieved June 12, 2008. ^ a b Davidson, Justin (October 8, 2007). "The Liberation of Daniel Libeskind". New York Magazine. pp. 56–64. ^ Libeskind, Daniel (2004). Breaking Ground. New York: Riverhead Books. p. 41. ISBN 1-57322-292-5. ^ See, Frequent Flyer. When the Wife is a Lucky Charm, Don't Leave Home Without Her. The New York Times, Tuesday, August 9, 2011, p. B6. ^ Jewish Museum Berlin. "Jewish Museum Berlin ��� Daniel Libeskind". Archived from the original on October 13, 2007. Retrieved February 25, 2009. ^ "History - Cranbrook Academy of Art". ^ Yu, Myung-hee (2007). Daniel Libeskind. OPUS 1946-present. South Korea: I-Park. p. 34. ISBN 1-57322-292-5. ^ Pearman, Hugh (July 27 – August 1, 1998). "Walls hold back the forgetting". Zeitgeist. pp. 26–27. ^ Hooper, John; Connolly, Kate (2001-09-08). "Empty museum evokes suffering of Jews". the Guardian. Retrieved 2018-07-19. ^ "Voices on Antisemtisim interview with Daniel Libeskind". United States Holocaust Memorial Museum. 2007-09-13. Archived from the original on 2010-12-01. ^ "Fiam - Daniel Libeskind". Fiamitalia.it. Archived from the original on 2017-04-18. Retrieved 2017-03-13. ^ "daniel libeskind structures paragon table lamp for artemide". Designboom.com. Retrieved 2017-03-13. ^ "Jacuzzi® and Daniel Libeskind together at Fuorisalone 2013". Jacuzzi.co.uk. Retrieved 2017-03-13. ^ "Olivari B. - Daniel Libeskind". archive.is. 16 June 2013. Archived from the original on 16 June 2013. ^ "Sawaya & Moroni". Sawayamoroni.com. Retrieved 2017-03-13. ^ "Poltrona Frau". Pfgroupcontract.com. Retrieved 2017-03-13. ^ "Articles - Daniel Libeskind | Atelier Swarovski". atelierswarovski.com. Retrieved 2018-07-19. ^ "Daniel Libeskind Exhibits Six New Design Objects At Salone Del Mobile". Architizer.com. 2013-04-12. Retrieved 2017-03-13. ^ Kyle MacMillian. "Pro-Libeskind forces fire back". The Denver Post. Retrieved 2017-03-13. ^ a b Nicolai Ouroussof (2006-10-12). "A Razor-Sharp Profile Cuts Into a Mile-High Cityscape". The New York Times. Retrieved 2017-03-13. ^ a b Curtis, William JR (2011-09-21). "Daniel Libeskind (1946- ) | Thinkpiece". Architectural Review. Retrieved 2017-03-13. ^ "Slash and yearn". Articles.latimes.com. 2008-06-04. Retrieved 2017-03-13. ^ Hatherley, Owen (2013-11-07). "Whatever happened to student housing? | Analysis | Building Design". Bdonline.co.uk. Retrieved 2017-03-13. ^ "Ogden Centre for Fundamental Physics, Durham - RIBAJ". ribaj.com. ^ "Libeskind Tower: now under construction after the completion of Isozaki and Zaha Hadid's projects". Archived from the original on 2017-11-07. Retrieved 2017-11-06. ^ "Peres invited to advise on restoration of Vilnius synagogue", Times of Israel. ^ "Downtown Tower - Libeskind". Libeskind. Retrieved 2018-10-06. ^ "K18B – A-Class Office and Radisson RED Lifestyle Hotel Complex - Vilnius MIPIM2018". Vilnius MIPIM2018. Retrieved 2018-10-06. ^ "Lasvit – glass installations, sculptures and design lighting". Lasvit.com. Retrieved 2017-03-13. ^ Hiroshima City. "General Description of the Hiroshima Art Prize". Archived from the original on September 19, 2008. Retrieved August 3, 2008. ^ "Document not found". 10 July 2011. Archived from the original on 10 July 2011. 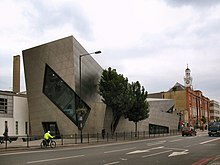 Wikimedia Commons has media related to Daniel Libeskind. Architecture in the 20th Century Liebeskind in conversation with Richard Weston and Melvyn Bragg, first broadcast 25 March 1999 on BBC4's 'In Our Time'. Unbuilding Walls Libeskind interviewed by Graft Architects.